Wed, Feb 13, 2019, 01:24 pm SL Time, ColomboPage News Desk, Sri Lanka. Feb 13, Colombo: Backed by a Singaporean firm's generous grant of a powerful database software, Sri Lanka began work on the first national digital databank of its SMEs and entrepreneurs on Tuesday, Minister of Industry and Commerce Rishad Bathiudeen said. The initiative, called NEDA-EMS, pioneered by the country's apex entrepreneurship agency National Enterprise Development Agency (NEDA), will execute a nationwide centralized database of all SMEs and entrepreneurs thereby boosting the performance of the critical economic sector very significantly. Meanwhile, first ever data collected from this digital platform's latest pilot tests showed that almost two-thirds of the MSMEs digitally captured, focused in the 'consumer' segment, followed by 'agriculture' and 'textiles'. Addressing the NEDA's InfoComm Digital Age project launch yesterday (12) Minister Bathiudeen said the initiative is also in keeping with similar upcoming digital databases in the South Asian region. "Therefore today's effort brings our SME sector in par with South Asia's SME digitalization efforts." Chairman - Director General of NEDA Dakshitha Bogollagma, CEO of Singapore's RES Group, Ms Trina Savage, Chief Technical Advisor-ILO Colombo Thomas Kring, and Additional Secretary M Thajudeen also participated in the event. On a personal request of NEDA Chairman Dakshitha Bogollagma, the software/database component of the EMS project was granted as a free gift to NEDA by its Singaporean maker RES Group. NEDA is equipping its field 'development' officers with 250 Tablet PCs to be used as data collection terminals to upload captured entrepreneur data in real-time. At the launch, Minister Bathiudeen also distributed the Tablet PCs to NEDA field personnel who flocked from all over Sri Lanka. 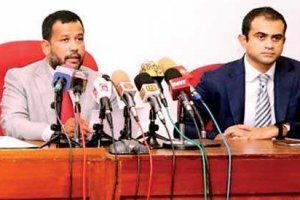 Minister Bathiudeen said NEDA's overall aim is bringing the Sri Lankan micro small and medium entrepreneurs and their enterprises to a centralized digital platform and the Info-comm digital platform will result in the first such digital database for SME and entrepreneurship sectors of Sri Lanka. "NEDA's SME Policy aims to create a significant number of technologically driven sustainable SMEs. The policy framework identifies special technology transfer to promote the adoption of modern technology by SMEs and dissemination of information on technology resources as a challenge faced by our SMEs. In that we believe that our SMEs to progress, their technology adoption too should be increased. On the other hand MSME's technology adoption to be successful, it is important that supporting stakeholders too should adopt and use technology. If the supporting agency is not familiar with technology then transferring them to entrepreneurs becomes a huge challenge. Therefore we start off with giving Tablet PCs to NEDA officials." Chairman �DG of NEDA Dakshitha Bogollagama said that current data entries at NEDA are manually done. "This is a very slow process and time consuming. Time has come to change it. The paper based recordings at NEDA are difficult to update continuously. Such old information are not presentable to any investor nor a buyer. This new system will be live 24�7. It also helps NEDA administration since our own employees' KPIs can be measured by this system." Making an eye opening presentation, Ms Trina Savage, CEO of Singapore's RES Group, said that the pilot test stream in Sri Lanka has already digitalized 9141 small business from five provinces. "We need to move with latest changes or else we would be left behind. This is true for Lankan SMEs too. Their main business focuses as per our system are manufacturing, production and marketing," she said. The overall cost of entire NEDA - EMS project is estimated at around $280,000. Of this, the software/database component is valued at US$ 147000 and it has been granted as a gift to NEDA by Singapore's RES Group.